1 When the Sabbath was over, Mary Magdalene, Mary the mother of James, and Salome bought spices so that they might go to anoint Jesus’ body. 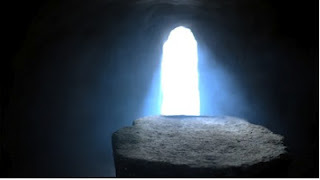 2 Very early on the first day of the week, just after sunrise, they were on their way to the tomb 3 and they asked each other, “Who will roll the stone away from the entrance of the tomb?” 4 But when they looked up, they saw that the stone, which was very large, had been rolled away. 5 As they entered the tomb, they saw a young man dressed in a white robe sitting on the right side, and they were alarmed.